When we think of 'mass," we usually consider the 'inertial' mass – the resistance of a body to acceleration due to an applied force. For a moving object, its mass is then a simple relationship between momentum applied to it, and the velocity it acquires. However, in some situations, this relationship is not simply proportional and can depend on the impulse applied to the object. 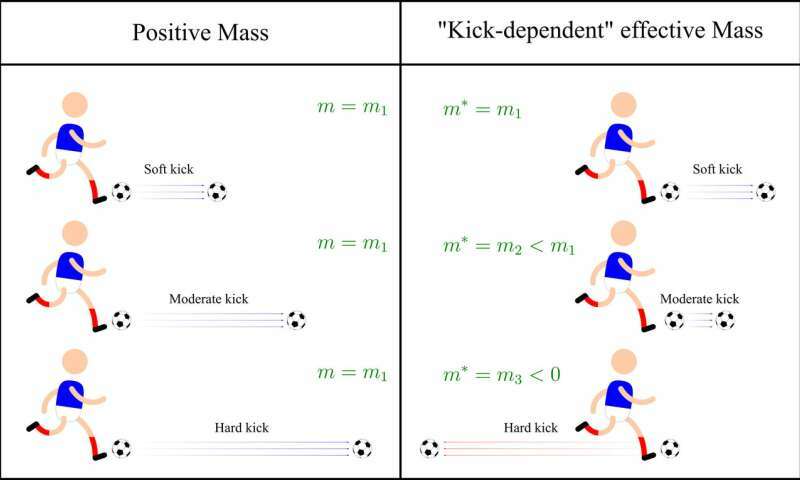 Physicists then talk about effective mass, which can even be negative. In such case, an object would move in a completely non-intuitive way when acted on by a force. "Imagine a soccer ball, you give it a first kick to get closer to the goal, you then give it an extra kick to score but instead of accelerating, the ball slows down! You're a bit puzzled, so you decide to kick the ball even harder, and it now moves towards your foot and not away from it," explains lead author of the UQ study, Dr. David Colas. Negative masses can be achieved experimentally at the particle level in various systems, for example using holes within semiconductors, by coupling light to matter in microcavities creating "exciton-polariton," or in atomic ultracold atomic gases under the form of Bose-Einstein condensates (BECs). "Negative-Mass Effects in Spin-Orbit Coupled Bose-Einstein Condensates" was published in Physics Review Letters in July. The UQ theoretical research expanded upon an earlier study at Washington State University demonstrating a negative mass effect in the expansion of an atomic BEC, nicely illustrating the versatility and great tunability of this platform. In their study, the UQ researchers have clarified the effects associated to the different types of negative mass and identified the striking "self-interfering effect" in the atomic condensate, which had been originally predicted for exciton-polaritons. This builds a comprehensive picture of the 'self-interfering effect' observed in the WSU experiment but also shows how the interactions can assist and trigger the present mechanism. Thomas Young's 1801 double-slit experiment demonstrating matter wave interference was one the first observation of a quantum effect. Individual particles are sent on a screen with two slits are displaying interference as they go through it, exactly like waves. With an ultra-cold atomic gas, one can create the same kind of interference with the particles only, without the need of a screen and slits, simply by affecting their effective mass. "To carry on with the soccer ball analogy, imagine that if you kick it too hard, you will squeeze it against your foot for a bit. When the ball leaves your boot, it re-expands and you see that the front part of the ball will eventually travel slower that its bottom part. The ball then interferes with itself" continues Dr. David Colas. The WUS reported that negative mass effect can halt the free expansion of a BEC and lead to fringes in the density. The UQ study showed this was caused by self-interference of the wave packet, arising when certain mass parameters characterising the system become negative. Negative mass effects can come out under different form, such as self-interference. 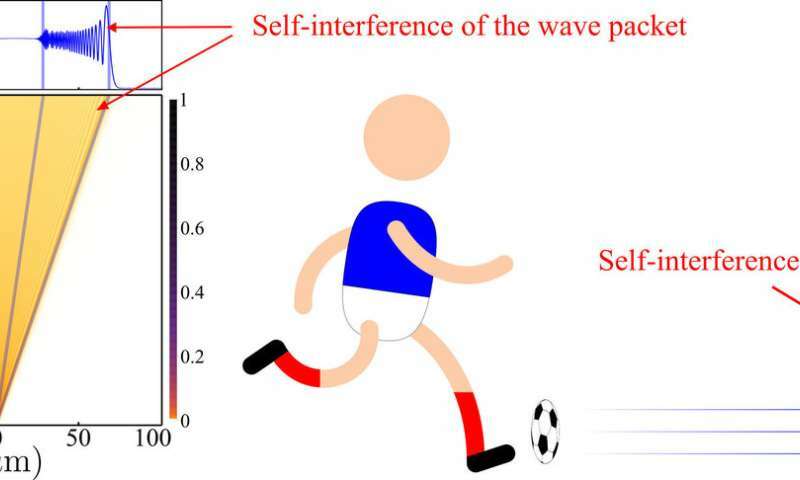 But one of the most striking one is the backward propagation for a positive impulse: the hypothetical soccer ball that accelerates towards the kicker's boot, not away from it. The UQ researchers show that this fascinating regime would be more achievable in atomic BECs, than with exciton-polaritons, opening the way to interesting new research paths. Clarification of the type of mass that is responsible for each observed phenomena will avoid common misinterpretations about negative mass. Such clarification will help get negative-mass research back on track.